Governor Andrew M. Cuomo today announced $5 million to continue the successful 43North startup competition in Western New York in 2017. 43North attracts early-stage companies from around the world to compete for the opportunity to turn ideas with high growth potential into funded enterprises – all while leveraging the resources and talent of Western New York. With the Governor’s announcement today, another year of funding will bring dozens more competitors to discover the advantages of building a business in the Buffalo region. Over the last six years, Western New York has experienced the strongest business growth in decades -- and the unemployment rate has dropped from 8.1% in September 2010 to 5.0% in September 2016. The Governor made today’s announcement at the final round of the 2016 43North Competition. Out of a total of 542 competitors at the start of the competition, these fifteen finalists will compete in front of a panel of notable judges, including experts like Soraya Darabi, Co-Founder of Zady and Foodspotting and Matthew Ryan, Executive Vice President and Global Chief Strategy Officer of Starbucks. The top 10 finalists will then present again during the 43North Million Dollar Round to another panel of expert judges on Thursday, October 27th to compete for 43North's top cash prize of $1 million, a runner-up prize of $600,000 or one of six $500,000 prizes. Those winners will be announced during the 43North Finals Awards Celebration, emceed by Luke Russert, at Shea's Performing Arts Center in Buffalo. Winners will also receive free space at the 43North incubator on the Buffalo Niagara Medical Campus for one year, guidance from mentors in related fields, the chance to apply for up to $400,000 in follow-on funding and access to other business incentive programs. Since Governor Cuomo announced the launch of the 43North competition in 2014 in conjunction with the successful Buffalo Billion, the competition has helped the Western New York economy grow jobs today while sowing seeds for long-term economic development. In the last two years, 21 companies have participated in the competition, and have raised a combined $15 million in funding in the 22 months they’ve been active in the program. Of those 21 companies, 16 continue to operate in Buffalo. Among them are companies like Energy Intelligence, who was featured as one of the Forbes 30 Under 30, for developing a technology that creates clean energy out of truck traffic. With Western New York growing rapidly, this competition is a win-win for the region and all aspiring entrepreneurs looking for expert guidance and a community that will foster innovation. Mayor Byron Brown says: "43North is showcasing the emerging innovators that are flooding Buffalo with their unrivaled talent. Western New York has garnered a reputation for itself as a leader of cutting-edge entrepreneurialism. Thanks to the leadership of Governor Cuomo, 43North has become a staple vehicle for that continued growth and momentum in the region." County Executive Mark Poloncarz said: "The growth of Buffalo's entrepreneurial ecosystem is the key mark of a city on the move. The 43North competition has allowed us to identify and welcome some of the world’s most promising entrepreneurs to our community, and I look forward to welcoming a new generation of innovation to Buffalo’s booming entrepreneurial landscape." Assemblyman Sean Ryan says: "Buffalo's resurgence is unmistakable. From corner to corner, the transformation is tangible. Thanks to Governor Cuomo's leadership, 43North is attracting attention from around the world, and further cementing Buffalo's role as the center of innovation and growth. We are proud of what the competition has accomplished so far, but without a doubt, the best is yet to come." 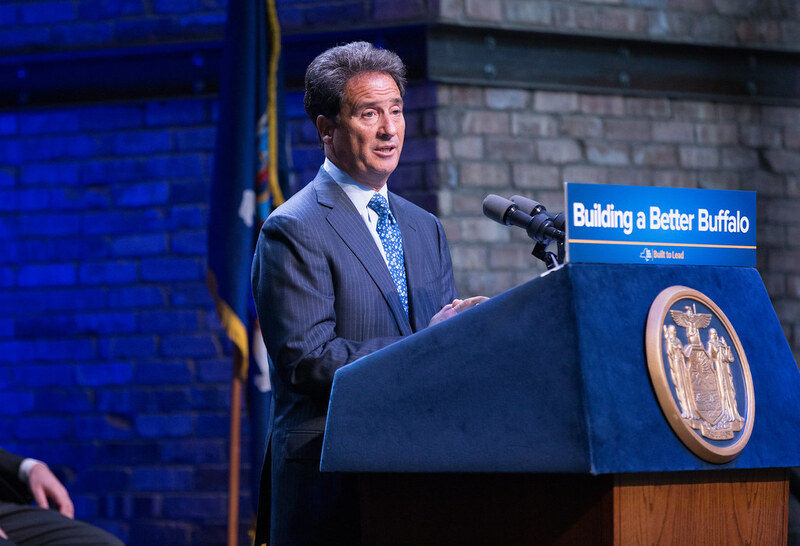 Bill Maggio, Chairman of the 43North Board of Directors said: "On behalf of 43North and Buffalo’s startup community, we truly appreciate Governor Cuomo’s continued support of this dynamic competition. We remain committed to driving the growth of Buffalo’s startup ecosystem and look forward to hosting entrepreneurs from around the world for a fourth year, as they vie for another $5 million and compete to do business here." Each year so far, 43North has awarded a total of $5 million in cash prizes, and has offered free incubator space in Buffalo for one year, guidance and access to other business incentive programs. The $5 million in funding for the next year will be provided by Empire State Development. An additional $2 million is expected to be considered for the competition by the Western New York Power Proceeds Allocation Board. The Power Authority contributed $6 million to this year’s competition; additional support comes from National Grid and several other sponsors. More information about the competition is available able at www.43north.org.